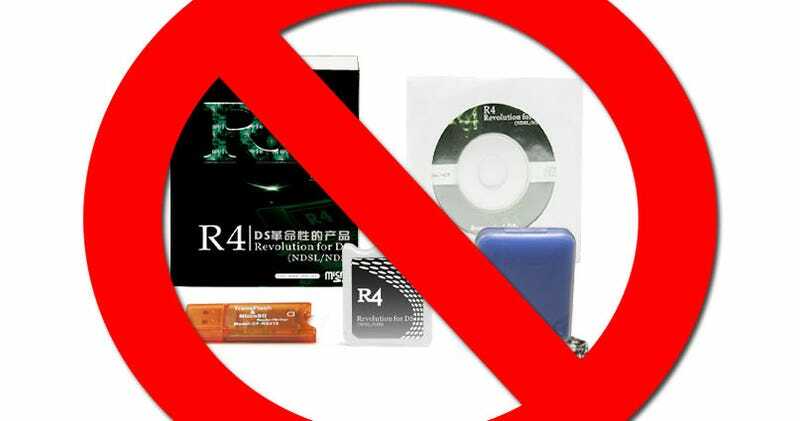 Last year, Nintendo (and 53 other companies) took action against the makers of the R4 cart, a device which allows, amongst other things, the pirating of games on a DS. Today, they won big. The Tokyo District Court has found against the Chinese makers of the R4 - officially known as the "R4 Revolution for DS" - and granted an injunction against sales of the device, prompting Nintendo, Square Enix & Capcom to issue statements proclaiming that they're a "violation under Japan's laws". Most outlets have already halted sales of the R4 following pressure from the lawsuit (and the publishers, such as Nintendo & Capcom, backing it), but this ruling now makes it official: you can't legally sell the thing in Japan. Is Nintendo&apos;s Legal Suit Helping R4 Sales? The statement concludes with the 54 companies saying they'll continue to pursue other manufacturers of similar devices. It'll be interesting to see what effect this ruling has on the status of the R4 in other markets.